Fleet No. 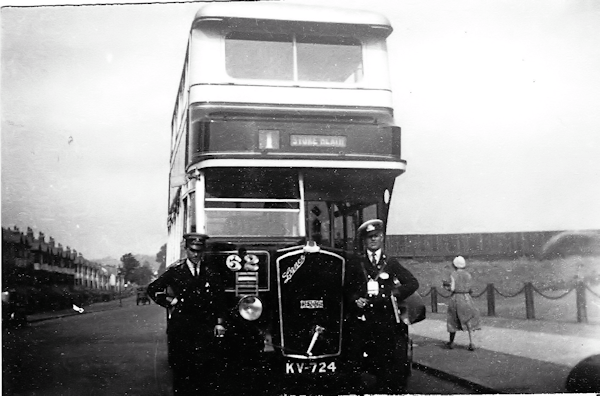 62 was one of only two Dennis double deckers, both delivered in March 1932, the same month that Service 1 terminus was relocated to the Maudslay Hotel. 62 is seen here at the Chaplefields terminus, with the posts and chains outside the Maudslay Hotel visible on the right and the houses on the South side of Allesley Old Road visible on the left of the picture. The houses to the West of the Maudslay appear to have not been built and the orderly lines of plane trees along the Allesley Old Road are nowhere to be seen. This photograph was supplied by Geoff Cowley, printed from a negative loaned to him by Alf Owen in the early 1960s.